The Frogmarch: Ou Sont Les Lions de Detroit? Thanksgiving is not a holiday in France; here, pilgrims are people walking to Spain, not guys carrying blunderbusses, wearing shoe buckles on their hats, and dying of dysentery. I didn't even take the day off from work, opting instead for a scaled-down Thanksgiving dinner at suppertime. Turkey. Sure you can get turkey in France. Right there next to the sliced ham in the Monoprix deli case. What, you want a whole turkey? The whole thing? Right, not the head and feet, sure. Lemme check with the other guys. [minutes pass.] Sure, no problem. We got a guy up in Bresse who can special-order you one. Now, how big? Five kilos! Really? Wow, I dunno. Hold on a minute, let me call him back... A colleague of mine went through this process and ended up paying 90 Euros for her turkey. Fortunately for us, there's this store called Picard that sells frozen food exclusively (I beleive they're American-owned). 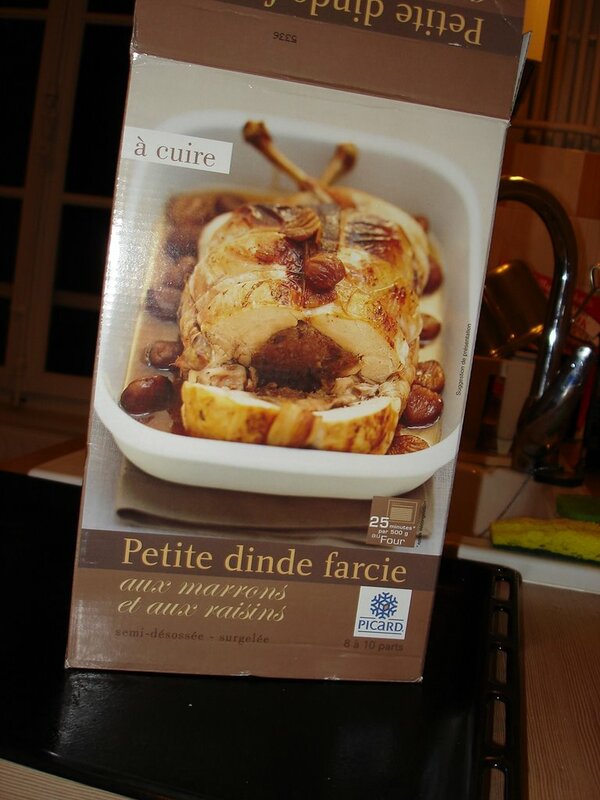 We were able to get a small frozen stuffed turkey there for a much more reasonable price [see pic of box]. Sure, only 2.5 kilos, but that's enough for V and myself, and the few little tidbits Boog will eat. Sweet tater casserole with marshmallows. 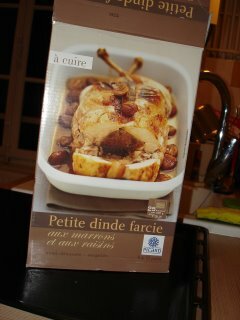 You can get patates doux from the marche if you look hard enough. Marshmallows? They sell them at the big Carrefour store at the Part-Dieu mall--but you have to look in the candy aisle. Plus they're pink. Green bean casserole. Haricots verts, pas de probleme. Funyuns to crumble on top to represent Durkee fried onions? That's tougher. Fortunately we had seen a Funyuns-anologue in one of the Asian groceries in Chinatown. So yes: Korean funyuns on a typically middle-American dish made with French green beans. Dinner rolls. Actually a pain campagne from the corne boulangerie... there's no such thing as dinner rolls here. Wine. Well, that part was easy. 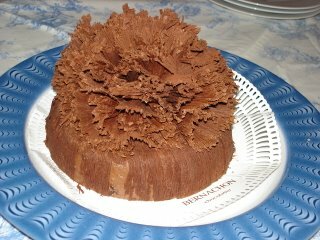 Le President cake from Maison Bernachon. Bernachon is by reputation one of the finest chocolatiers in the world. Their shop, in the ritzy part of the Sixth, is a wonderland, where impeccable salesladies in in tasteful chocolate-brown suits attend every need of their impeccable clients. But I needed a cake--V had been clamoring for one since her birthday in August, when Bernachon is closed for the whole month. The impeccable saleslady suggested the Le President cake for four people, their signature cake. Who was I to argue? [see pic.] The cake is topped with these thin, lacy hand-drizzled ribbons of pure chocolate standing straight up on edge. How the heck do they do that? Would this be the best cake I ever had? Um, pretty much. Maybe they just got lucky this time. When I was looking up the phone number for Bernachon the other day, Google brought up this blog. 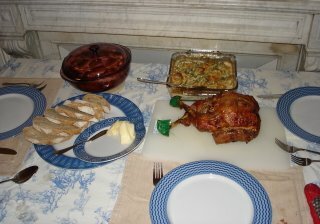 Like mine, this blog is written by an American living in Lyon. Unlike mine...well, almost everything about it is unlike mine. Go have a look at some really spectacular food photography, and some spectacular food that does not involve Funyuns. I'll just be here, sobbing over the crumminess of my blog. Oh yeah, I added some pictures to the previous post, so be sure to scroll down and check 'em out. Do you think Degree-programs-online will pay you in Euros? Enjoyed the article (as usual). (Much better than that OTHER blog.) How was the stuffing?? You know, the turkey is just a vehicle for the stuffing. sisterj and nieceC could have told you about the marshmallows from reading "Family Sabbatical"
Your blog is much better! All that todo about food when you can go to Bernacheron. BTW our macaroni and pears were just delightful.